Posted in General Health & Wellness on September 10, 2011. Last modified on April 02, 2019. Read disclaimer. As if the environmental impact of plastic bottles wasn't bad enough*, consider this: many doctors and scientists believe that drinking from plastic may also be bad for your health. They're concerned that several of the chemicals in plastic bottles and containers may leech into the foods and beverages they contain. 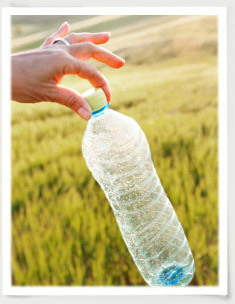 Concerned about chemicals in plastics? Adults: may disrupt hormones and increase risk of cancers. Infants and children: may contribute to hormonal changes, allergies, and possible nervous system and brain development issues. BPA (bisphenol A): makes plastics strong, such as in hard plastic nursing bottles, sippy cups and clear, hard plastic drinking bottles. Also used on the inside of metal food and infant formula cans to prevent rusting. Heat may be a factor in the amount of BPA released from the container into its contents. Styrene (used in production of Styrofoam and similar Polystyrene brands): potentially toxic chemical that may be released at temperatures above 80 F.
Never heat foods in plastic wrap (this includes microwaving). Parchment paper is a safe choice. Wax paper may be used in the microwave. Do not wash plastics in dishwasher. Dishwasher heat can cause plastics to break down, increasing the likelihood of bacterial growth and chemical transfer to contents. Never put warm or hot liquids or foods in plastic water bottles, nursing bottles, sippy cups or food storage containers. Use glass or stainless steel drinking bottles, when possible. Glass bottles wrapped in silicon sleeves are a good safe, reusable option. Avoid canned foods or baby formulas (especially those that are acidic or high in fat) that are lined inside with plastic, which may containing BPA. Also, never heat food inside the can. Reduce use of vinyl, PVC and Styrofoam. Opt for tap water or filtered tap water over bottled water. If you use carbon or reverse osmosis filtration, change filters according to the recommended schedule. Watch for container labels stating that they are "Phthalates-free" or "BPS-free." In 2006, Americans purchased nearly 31 BILLION plastic bottles of water. If stacked on top of each other, that's enough to circle to the moon and back 6 times. Even more concerning is that only 10% of these will get recycled. The other 28 billion ended up as litter or in landfills. It seems hard to believe but I read recently that plastic bags and bottles account for 80% of all the man-made trash in the oceans. So if you are going to use plastic, at least recycle it or dispose of it properly.